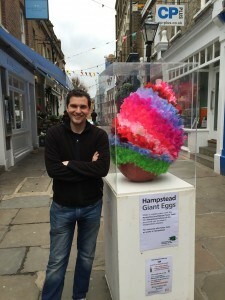 Home » News » Happy Easter from Hampstead! Happy Easter to everyone celebrating today. The core message of Easter is one that can be embraced not just by Christians, but those of all faiths and none: the triumph of life over death, hope over despair, good over evil, and love over hatred. All of these are worth celebrating. More locally, two giant Easter eggs have been placed – one on Haverstock Hill outside Budgens and one on Flask Walk outside, well… my flat. The project is being run by the Hampstead Shops Campaign, led by Jessica Learmond-Criqui, and supported by the Hampstead School of Arts. The aim is to encourage people to spend more time in our beautiful shopping areas and support local stores: a cause I wholeheartedly support! I hope you have a happy and joyous Easter.